Ring (ring ring). Letters through your door. (Hee Hee). "Oca, Oxalis tuberosa (Oxalidaceae) or New Zealand Yam as it is more commonly known, is a perennial herbaceous plant that overwinters as underground stem tubers. The plant was brought into cultivation in the central and southern Andes for its tubers, which are used as a root vegetable. The plant is not known in the wild, but populations of wild Oxalis species that bear smaller tubers are known from four areas of the central Andean region.Oca was introduced to Europe in 1830 as a competitor to the potato, and to New Zealand as early as 1860. In New Zealand, oca has become a popular table vegetable and is simply called yam or New Zealand yam (although not a true yam). It is now available in a range of colours, including yellow, orange, pink, apricot, and the traditional red"
One of the things about Oca that gets people excited is that since it is a totally different family to the potato it doesn't fall victim to the same pest and problems, so areas that are suffering with blight can rest easy if they swap their 'taters for these tubers. I love growing things that can't be found on the supermarket shelves so I'm really stoked about getting these in the ground. On a side note, Oxalis is the same family as Sorrel, and we have some lovely pink Oxalis growing wild all over our front garden so I'm sure the Oca will do well here. Kev also sent us over some Cucamelon seeds, some hot chilli seed and some bread poppy seeds. I've grown HOT chilli plants for some years now, from Scotch Bonnets, to Dorset Nagas, Royal Blacks, Habaneros and Trinidad Scorpions, I'm a bit of a hot head and love things hot and spicy so looking forward to growing the chillis out. The poppys will be great, we have wild poppies all over the front and back gardens and I love the colour they bring to the garden and they are always alive with bees. We actually tried to grow Cucamelon last year and although the plant grew up the fence it never bore flowers or fruit but I think that was because it was so late in the year by the time we got the raised beds finished, fingers crossed we will have better luck this year and finally be able to try these mouse melons! In other news, I bought a couple of flavoured ginger beers to give me some inspiration for possibly making my own and can honestly say that the Scottish Raspberry is possibly the nicest thing I've ever tasted! I'll be doing some experiments on finding the best way to infuse this flavour into my own homebrew so stay tuned and I'll keep you updated. 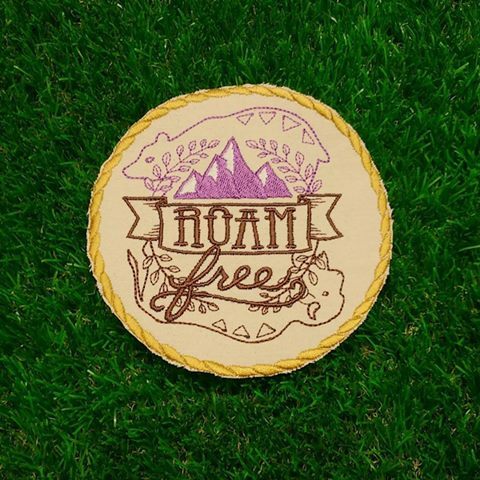 Lastly I'll show you our latest patch design for the blog, Roam Free. I think this one is my favourite so far! Hope your are all having a good week so far, The Weekend is almost in sight! I grew cucamelons for two years, they are very hard to start, but in the end I decided the taste was not worth the effort. The outside bush grew as many fruits as the bush in the green house, but we are sheltered here along the south coast. I have Oca to harvest. Glad you like them! The bread seed poppy are good as the seed heads don't open so you can collect them up at your leisure. My girls love cucamelons so I hope your brood does as well.